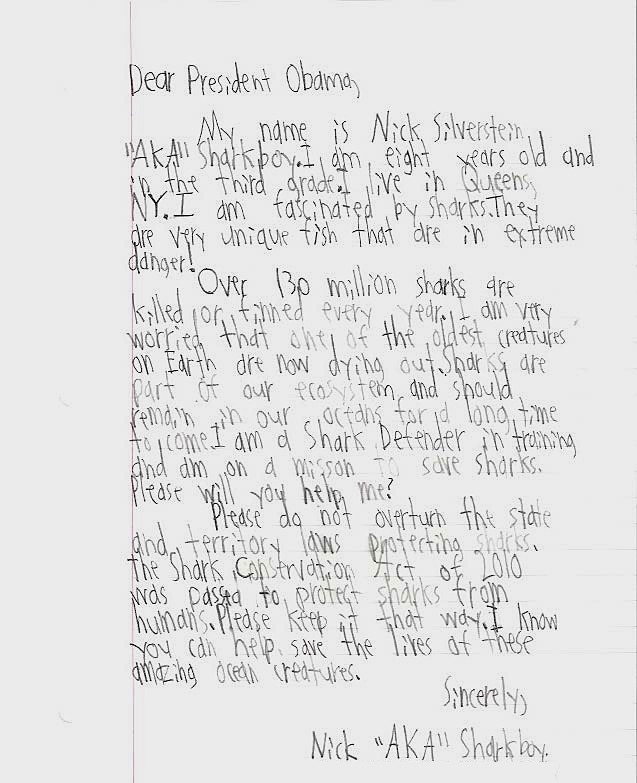 Shark Defenders: If an 8 year old can write a letter to Obama, so can you! If an 8 year old can write a letter to Obama, so can you! 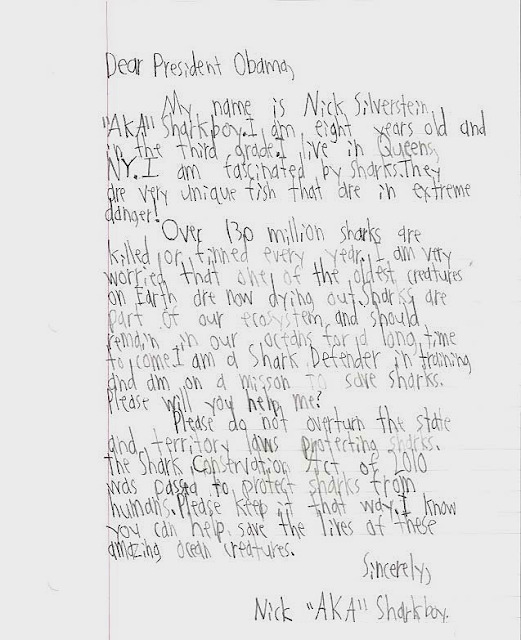 Nick Silverstein is an 8 year old shark activist from Queens, New York. He's been featured in a couple of local newspaper and television stories, but now he's going national. The United States' government recently proposed to backtrack on shark conservation progress achieved over the past several years. The National Oceanic and Atmospheric Administration is proposing a rule that, if approved as is, has the potential to overturn the shark protections passed by California, Delaware, Hawaii, Illinois, Maryland, Oregon, Washington state, American Samoa, Guam, and the Northern Mariana Islands. Thousands of environmentalists and students who supported the passage of these laws have initiated a letter writing campaign to stop this backtracking from taking place. We are asking NOAA to not preempt, and thus overturn, the shark protections in the states with a federal rule. We have to stop these activist rulemakers! Nick's letter to President Obama is below and it provides a perfect example of how to write a comment letter. In three simple paragraphs he (1) introduces himself and explains why the President should listen to him, (2) gives some background information on the issue, and (3) makes a specific ask on how to amend the proposed regulations. Nick's letter is also handwritten and contained to a single page, which is preferable. So if an 8 year old kid living in Queens can write a letter to the President, what's stopping you? We are compiling letters and will ensure that they are received by the right people. The official announcement in the Federal Register contains instructions on how to submit your letter using an online form, fax, or mail, but we encourage you to send us a copy of your letter at info@sharkdefenders.com. If you need help, we can send you talking points. You can also use some of the information found on the Pew Charitable Trusts petition or our previous blog on this issue. The professional resume review is all about knowing new things that is quite necessary for students who are going to apply for jobs. If you can write to Obama what you gonna write? Are you going to ask personal questions, or ask about politics, ask for something for you. You may discuss here on these interesting topic with different teachers, students, bloggers and writers. Now, I believed that this boy is gaining some good confident of himself just to write a letter to Obama. I am so confused about what he was trying to reach out to the former President of the United States. With Bulk Texting you can achieve what most businesses are aiming for which is real time communication. This enables businesses to send out daily promotions in real time and ensure that they are read within minutes of delivery. This Is Sustainable Shark Fishing?